South Coast Sport Fishing at its Best! I’ve been targeting swordfish on the south coast of Western Australia for about two and a half years. On the successful day I launched at 4am from a boat ramp in Oyster Harbour not far from my house with a mate. The weather was pretty good for Albany, the wind was about 8-10 knots with a metre of east sea slop on top of a 2.5 metre southwest swell. Those conditions made it a slower than usual trip to the shelf but we arrived at a good samson fish spot at the top of the canyon at about 6am. First drop resulted in a nice samson fish on jig. I had one drop for a sword in the middle of the canyon with squid bait for no luck before steaming for another half an hour to a 50 metre lump coming out of 770 metres. Things I did differently was switching from squid bait to freshly caught fish belly strip sticked into the hook, this bait swum naturally and is much more durable than squid which is important because there are lots of small dog sharks and squid that shred your bait. Also sword fish feed by swiping at their prey with their bill to stun the prey before eating it. Any bait that is not tough and secured to the hook will be knocked off by these powerful swipes. I noticed small bites that are typical of swordfish about 15 minutes into the drift and I started to tease the fish by dropping the bait back 20 metres and bringing it back up, I continued this for about 20 minutes before the sword committed to the bait and I came up tight. The fight was actually quite un-spectacular, it took about half an hour but the fish basically swam strait to the surface, this is not unusual for a sword fight however they usually dive back down to 600 metres and the real fight begins, I think we were lucky enough to leader the fish on its first surface. Largely thanks to my mate, Matt Stadler, who fearlessly grabbed the bill bare handed and held on while it thrashed alongside before we could secure the capture. The most applicable local study I have found on swordfish age and growth data was an FRDC paper published in 2001 (Age and growth of broadbill swordfish (Xiphias gladius) from Australian waters) by authors Jack Young and Anita Drake. 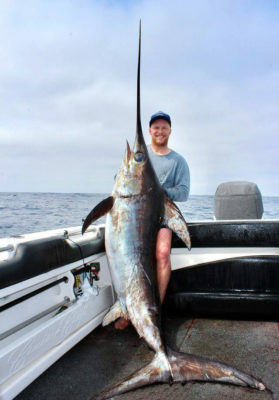 This study looked at age and growth (length) of 188 swordfish caught in the Southern and Western Tuna and Billfish Fishery and 1589 swordfish caught from the Eastern Tuna and Billfish Fishery. The results from the Western Australian fish (Indian Ocean and Southern Ocean inside the EEZ) showed that the oldest female was 15 years of age and the oldest male was 9 years of age. This study produced a pretty accurate length to age radio which indicates the fish I caught most likely ranged in age from 5 to 9 years. Other interesting findings were that female sword fish numbers almost doubled male numbers and that females grow much older and larger (the east coast study found an 18 year old female and a 13 year old male). 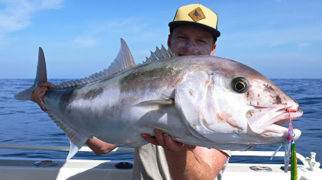 In general you can say that sword fish are very fast growing and relatively short lived compared with common table fish that WA fishers are used to catching (Bight redfish have been aged up to 84 years old) and therefore, in my opinion, a very responsible fish to target for food. If you do the maths you would have to catch 150 bight red fish to get the same amount of fillets (50kg, fillet retention on bight redfish is about one third of body weight), therefore if an average large (3kg) bight red fish is 50 years of age then you would have to kill 7500 years of life in order to match the harvest off the approximately six year old swordfish. Literally food for thought. Another interesting point is that when I filleted the swordfish I discovered it was a ‘pumpkin.’ This is a term used in sword fishing circles and the seafood industry to describe the highest quality and most desirable swordfish flesh. The flesh of a ’pumpkin,’ as the name suggests has an orange tint and is thought to be a result of a fish that has been feeding extensively on red deep water shrimp. The astaxanthin (a carotenoid) in the shrimp is thought to tint the sword fishes flesh. Pumpkin’s are considered tastier than normal, white fleshed swordfish. My sword was delicious and only two weeks after its capture it has nearly all been eaten. The flesh holds together like a beef steak however is very tender and has a sweet prawn flavour. Have you Caught up on our Director Election Results?